Lama Pema Tsewang aka Lopön Pemala (1926—2009) was a main Bhutanese student of Dudjom Rinpoche, and a main support for the spread of the Dudjom Tersar lineage in modern Bhutan. In 1961, the Third King of Bhutan, Jigme Dorje Wangchuck instructed Lama Pema Tsewang to join the newly established Rikzhung Institute at Semtokha as one of its tutors. There, he oversaw the needs of about one hundred students each day. Lama Pema Tsewang took a leading role in helping the King Jigme Dorje Wangchuck’s ambition that all Bhutanese should be able to read and write the national language of Dzongkha, as part of his plan to modernize the nation. In 1973, Lama Pema Tsewang was transferred to Thimphu as the Director of the National Library. He composed a history of Bhutan: “The History of Bhutan: The Luminous Mirror to the Land of the Dragon”. 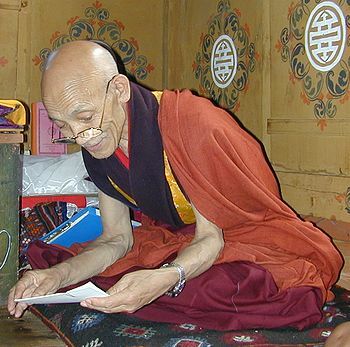 After his retirement from the Government services in 1993, Lama Pema Tsewang was able to fulfill a long pending request from the monastic community and the people at large by accepting the position of abbot at Nymalung Monastery, where he had begun his religious life at the age of twelve. Lama Pema Tsewang, affectionately known as Lam Pema-la, continued to teach students and monks until his passing in March 2009. This page was last edited on 9 December 2017, at 09:57.